The Bureau of Alcohol, Tobacco, Firearms and Explosives (ATF) recovered over 5,000 firearms including 4,243 handguns in New York City during 2008 [ATF]. That year, 292 individuals were killed by gunfire in New York City [NYT]. Statewide, 57% of murders, 30% of robberies, and 13% of aggravated assaults were committed with firearms in 2008 [FBI]. With the high percentage of firearms involved in murders and other crime, more must be done to reduce the use of firearms in crimes. In many cases, a spent bullet casing is the only critical piece of evidence recovered by police. Until recently, without the firearm it came from, police were left with minimal leads to identify the shooter. Enhanced technology has been developed to assist law enforcement in linking bullet casings found at a crime scene with the gun that fired it. 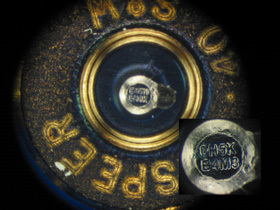 The technology, known as microstamping, equips every semi-automatic handgun firing pin and breach face with a unique code that becomes imprinted on a bullet casing each time the gun is fired. When police collect the bullet casings they can connect the bullet back to the firearm's last legal owner. Microstamping provides law enforcement with an immediate lead in the case and eliminates the need to recover the firearm at the scene to identify where it came from. Although crimes in New York City are often committed with illegally acquired firearms, microstamping will act as a deterrent to those people with clean records who supply guns to criminals (known as straw buyers). Straw buyers who understand that the gun can easily be traced back to them, will be forced to think twice before making another purchase. This will help to reduce the supply of illegal firearms. This technology expands on currently used scientific approaches to solve gun crime. Currently, bullets can be linked to the guns they came from by examining the unique impressions on the casing produced by the inside of the gun. 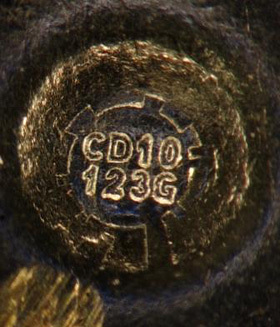 Digital images of the casing are compared to a database of images available through the ATF's National Integrated Ballistic Information Network (NIBIN) [ATF-NIBIN]. The NYPD has had over 2,100 "hits" (links of two ballistic images) using NIBIN [ATF-NIBIN]. For example, in August 2008, the NYPD arrested a male possessing a Taurus PT-92 9mm Pistol. After entering digital images of test fires from the firearm into NIBIN, police were able to link the gun to two previous shootings occurring in 1996 and 2000 [ATF-Hit]. Had these casings been microstamped the police would have had the opportunity to apprehend the individual using this firearm back in 1996 and eliminated the harm caused in 2000. Microstamping will enhance the capability of matching ballistic images and matching ballistics to guns. The microstamping technology has been tested to prove that the microstamp will not wear with use and is highly tamper resistant, as there are several redundant stamps, invisible to the naked eye, which act as back-up markings. Microstamping will have no impact on law-abiding gun owners, ammunition manufacturers or City and State budgets. No changes to the process of purchasing a handgun are necessary and the microstamp does not require altering the maintenance and cleaning technique for the firearm. There are no requirements resulting from microstamping legislation for manufacturers of ammunition. In addition, microstamping technology does not come at a cost to the City and State as no new databases or examiners are required, and the total cost for microstamping firearms—from as low as $0.50 per firearm—are incurred by the manufacturer. In April of 2009, the NY State Assembly passed legislation that would require that all semi-automatic pistols manufactured or delivered to any licensed firearms dealer in New York be equipped with the microstamping technology by January 1, 2011. To increase public safety, New Yorkers must encourage state legislators in the Senate to pass the legislation requiring microstamping technology. Microstamping will ultimately provide law enforcement with additional data that will help them to solve crime and prevent gun trafficking. Law enforcement agencies in New York should be provided every tool available to fight crime. Microstamping will quickly connect bullet casings to the gun used in the crime, providing officers with an immediate lead in the case. Microstamping will deter "straw buyers," who legally obtain firearms and then sell the guns to criminals, as these guns will now be able to be traced back to these buyers. Microstamping will deter rogue dealers, as guns will be able to be traced from the manufacturer to the distributor to the dealer. By deterring straw buyers and rouge dealers, microstamping will aid in cutting off a major source of crime guns.